At first, it wasn’t clear just what had happened in the women’s 100-meter freestyle at the Summer Olympics in Rio. It’s a blaze of a race that rarely puts big gaps between its finishers. But in this case, two swimmers who had matched each other stroke for stroke — Simone Manuel of the U.S. and Penny Oleksiak of Canada — came into the wall at the same instant. All was soon made clear: Not only had these two swimmers hit the wall together; they had also set a new Olympic record of 52.70 seconds, writing their names in the record book. 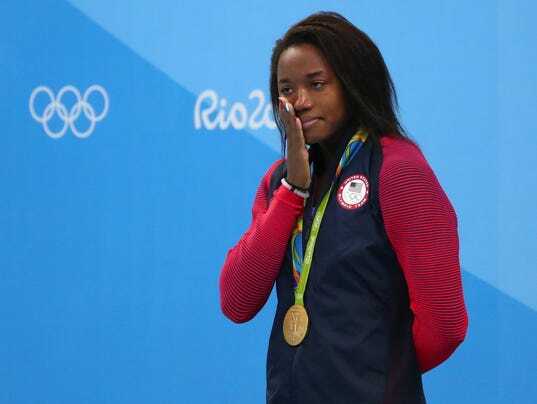 And while she was at it, Manuel, 20, set another mark, as she became the first African-American woman to win a gold medal in swimming for the United States. As she treaded water after her final, Manuel pointed up at the screen above the pool and seemed to be trying to take in what had happened — an understandable response, given the frenzied race she’d just swum. Her mouth gaped open; her hand covered it up. In the one-lap race, Manuel was in third place at the halfway mark, and Oleksiak was in seventh. But Oleksiak was nearly a half-second faster than Manuel on the final length, and TV replays showed that their fingers found the wall at the same time. The Olympic record they broke was only one day old, having been set by Australia’s Cate Campbell in the semifinals. In tonight’s final, Campbell finished sixth. With the win, Manuel gave Team USA their first gold medal in the women’s 100-meter free in 36 years — and as the U.S. Organizing Committee points out in a news release, that win in 1984 was also a tie, between Nancy Hogshead and Carrie Steinseifer. Under the Olympics’ scoring rules, when two athletes tie, they each get a medal — meaning that while this race has two gold medalists, no one gets a silver. Instead, Sweden’s Sarah Sjostrom won a bronze medal after finishing 0.29 behind the winners. In the end, they both stepped up around the same time. And then the audience at Rio’s Aquatics Stadium heard two anthems: America’s first, followed by Canada’s. This is the second medal Manuel has won in Rio; she won silver as part of the 4×100-meter freestyle relay team.